Genus Diagramma: Differ from Plectorhinchus in having much longer caudal peduncles (part of body before tail) and fewer dorsal fin spines. Diagramma pictum (Thunberg 1792), the Painted Sweetlips. Indo-West Pacific; Red Sea, eastern Africa to Japan and New Caledonia. to about a meter total length. At right: Half and one inch juveniles in N. Sulawesi. Below: First Row: three to four inch individuals in N. Sulawesi. Second row: A sub-adult one in Redang, Malaysia and adults off of Mabul, Malaysia. Plectorhinchus chaetodonoides Lacepede 1801, the Clown or Harlequin Sweetlips. Western Pacific. To twenty nine inches. One of the most commonly used species of the family... but rarely lives more than a few days in captivity. At right, a tiny, half-inch baby in its typical crazy/rapid "dance" (to avoid predation?) in S. Sulawesi. Below: Images of a juvenile (about three inches) in Fiji, a four inch or so individual in Mabul, Malaysia and a foot long adult in Fiji. 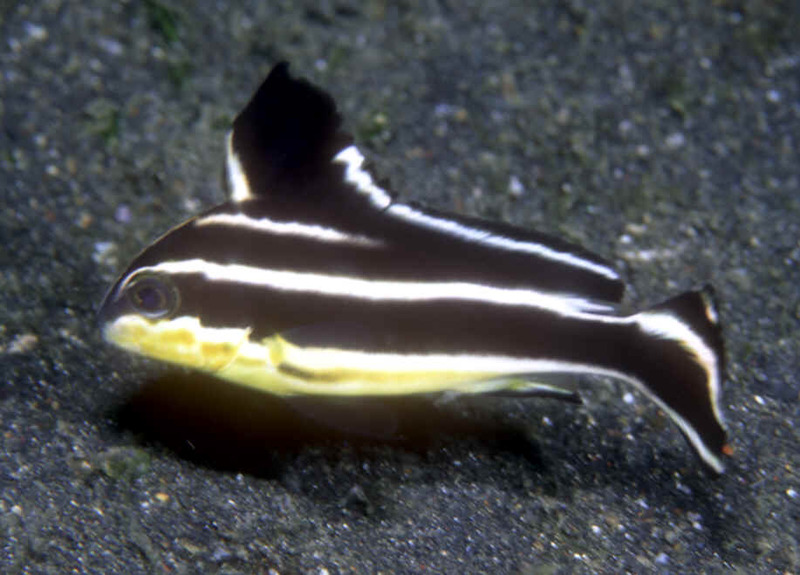 Plectorhinchus chrysotaenia (Bleeker 1855), the Yellow-Striped Sweetlips. Western Pacific. To sixteen inches in length. This semi-adult of about eight inches in Bunaken/Sulawesi/Indonesia. Plectorhinchus gibbosus (Lacepede 1802), the Brown Sweetlips. Indo-West Pacific; Red Sea to South Africa to Samoa and Australia. To some thirty inches in length. This one off of Pulau Redang, Malaysia. Plectorhinchus lessoni Cuvier 1830. West Pacific, to sixteen inches long. This semi-adult (eight inch) Below: An adult in S. Sulawesi, and two adults in N. Sulawesi. Plectorhinchus lineatus (Linnaeus 1758), the Yellow-Banded Sweetlips. Indo-West Pacific. To twenty nine inches in length in the wild. A juvenile in captivity and an adult in N. Sulawesi. Plectorhinchus orientalis (Bloch 1793), the Oriental Sweetlips. A commonly encountered (much of tropical Indo-Pacific) species in the wild and in the aquarium trade. Rarely lives for any period of time. To thirty four inches in length (not a mis-print). 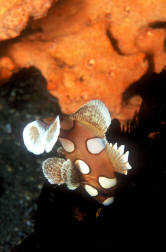 Below, a juvenile in the Maldives, a sub-adult in N. Sulawesi and an adult coloration individual in Fiji. Plectorhinchus pictus (Cuvier 1830), the Dotted or Painted Sweetlips. Indo-Pacific. Below, a three inch one in captivity, a juvenile in the Long Beach, California Public Aquarium of the Pacific and one in the Seychelles on a poor visibility day), to thirty three inches in length. "Marketed fresh". Plectorhinchus vittatus (Linnaeus 1758), the Indian Ocean Oriental Sweetlips. Indo-West Pacific (this six inch one in Bunaken/Sulawesi/Indonesia). To only two feet in length.